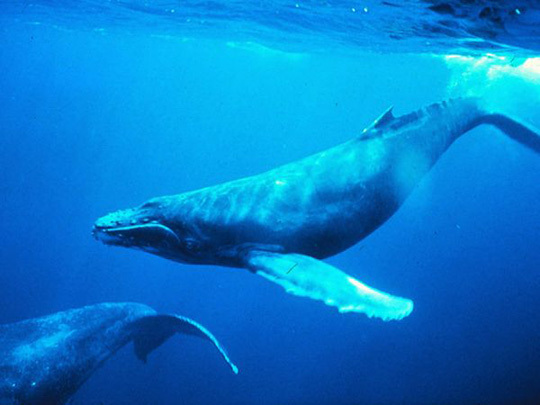 of Cetaceans (whales, dolphins, and porpoises) and seabirds." 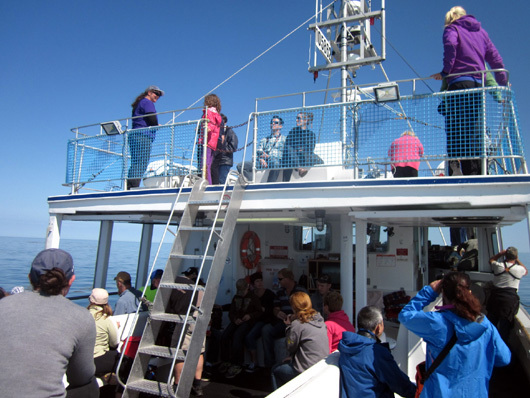 Today's weather was perfect for our whale cruise -- sunny all day with only a few clouds, a light breeze, low humidity, temps in the 70s F. We knew the weather had to be good or the Mega Nova wouldn't go out into the Bay of Fundy. I got up at 6 AM and saw a bright pink sunrise over low fog in the valley below the campground (no photos, unfortunately). 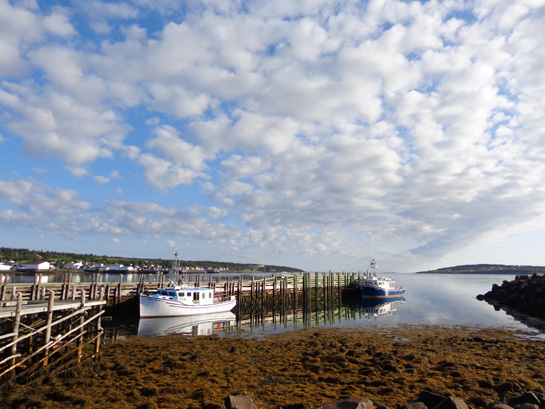 We didn't see any fog at 7 when we drove to Brier Island. 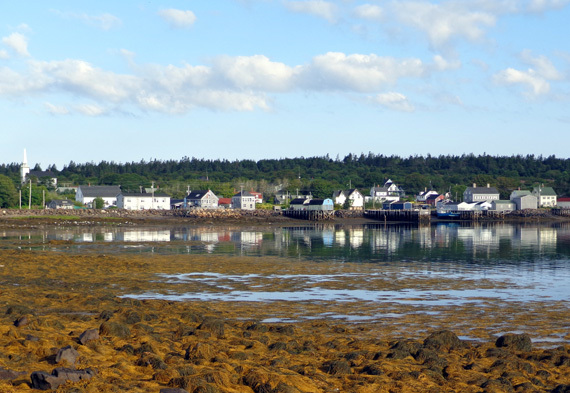 The early morning light was so beautiful on the way there and while we were waiting to board the Mega Nova for our whale cruise. 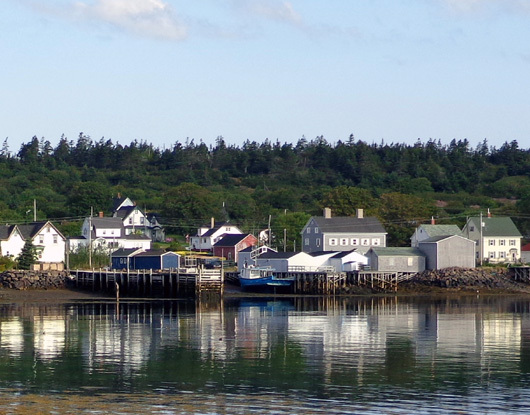 Like most of the passengers who had to travel to Westport on Brier Island via two ferries for the 9:30 AM cruise, we decided to leave ample room and caught the 7:30 and 8 AM rides to Long and Brier Islands. Some folks came over at 8:30 and 9 and the captain waited a few minutes for them to board. We didn't want to risk being left behind or making other passengers wait for us. That meant we had about an hour to kill after we picked up our tickets in Westport. 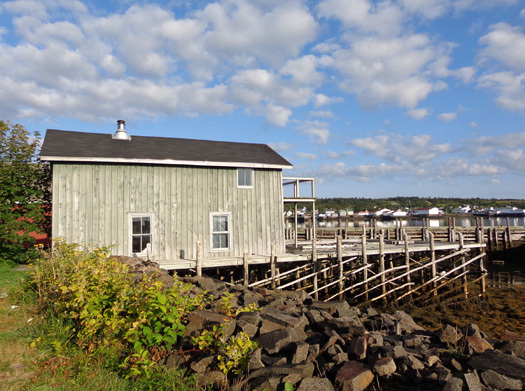 We drove a short distance out Gulf Rock Road to the bluff overlooking Westport Harbor, Peters Island, and Grand Passage where we saw such beautiful scenery yesterday. 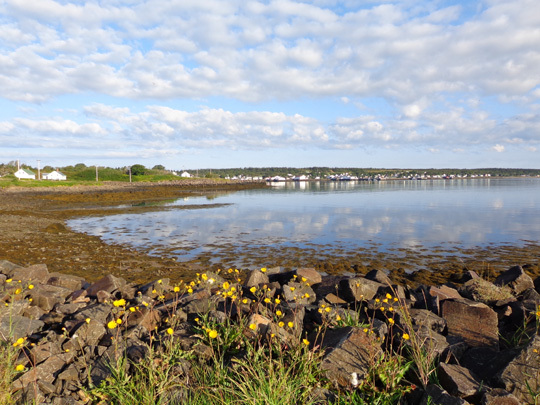 Lots of seaweed is exposed when the tide goes out. 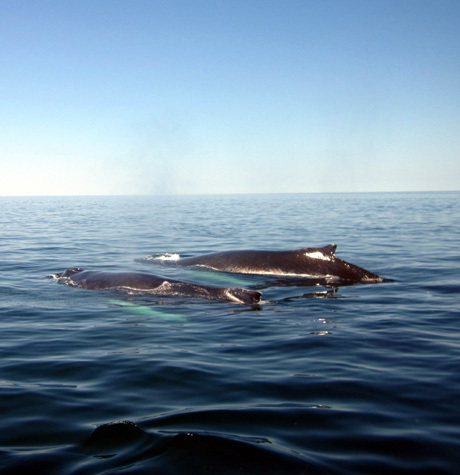 Although several species of whales spend the summer in the waters of the North Atlantic, humpback whales are the most commonly seen on whale cruises in this area because they are less afraid of watercraft than some of the others. 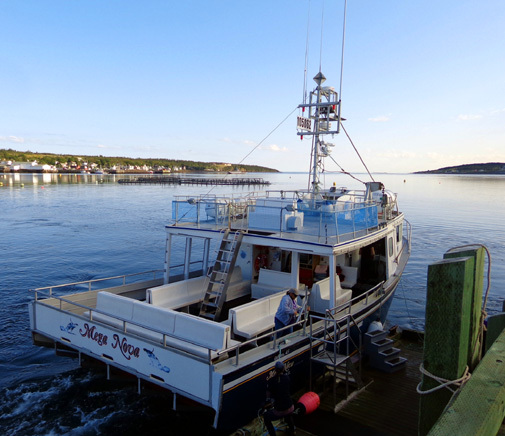 The M/V Mega Nova derived its name from the scientific name of the humpback whale, Megaptera novaeangliae, which translates to "Big Winged New Englander." 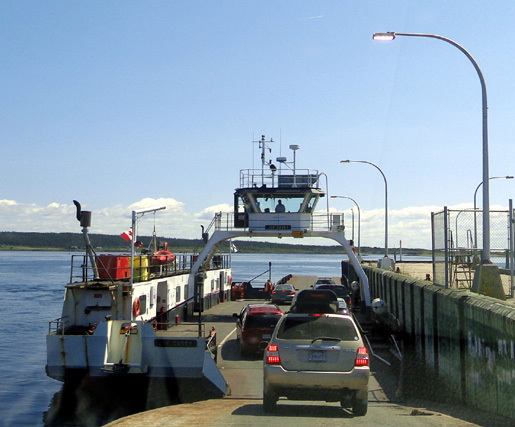 We got underway at 9:38 AM and returned to the harbor at 1:10 PM, just in time to catch the 1:30 PM and 2 PM ferries back to Long Island and Digby Neck. 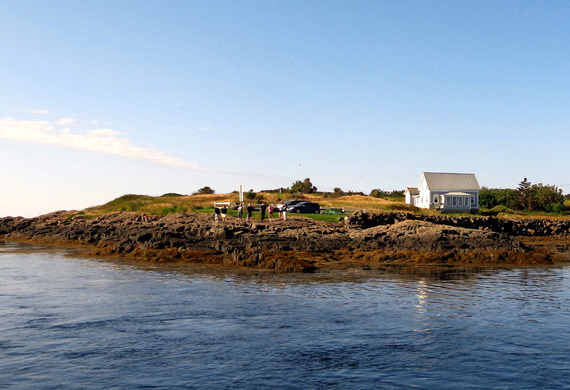 We were out on the boat for about 3� hours, which is average for this tour company. 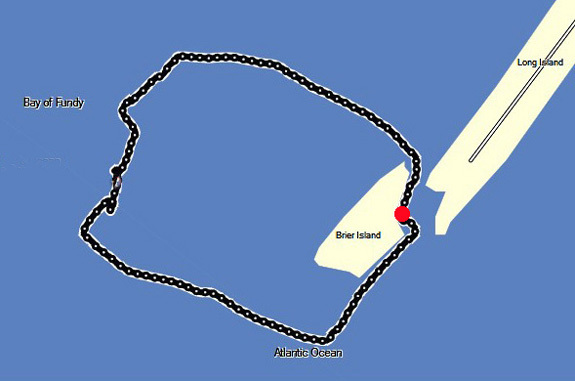 The duration depends on the weather, currents, and how many whale sightings occur. 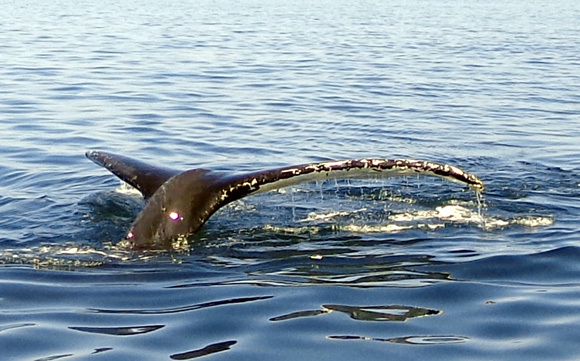 We had some good close encounters with several whales and were very happy with the experience. I was also happy that Jim took about three dozen pictures. He usually isn't interested. I've used several of his shots in this entry, too, including the one above that shows both whales exhaling or "blowing." 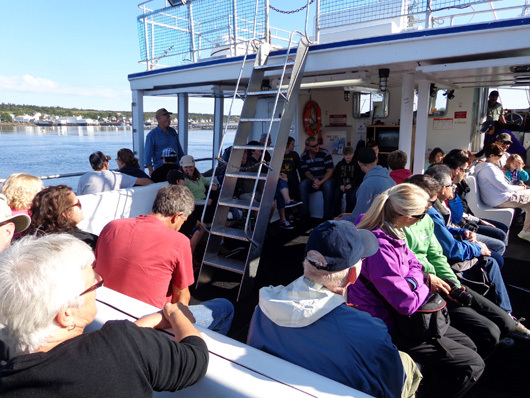 There were about 40 passengers and half a dozen crew members and college interns on our whale cruise. 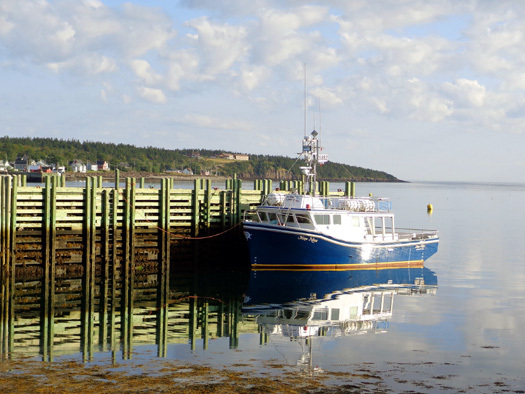 The captain who owns the company has been boating in these waters for 50 years. 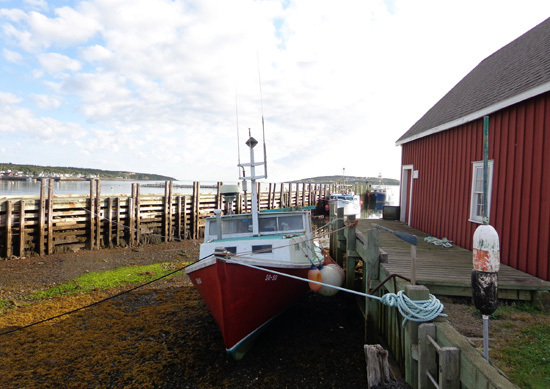 He's a tour boat operator in the summer and a lobster fisherman in the winter and spring. 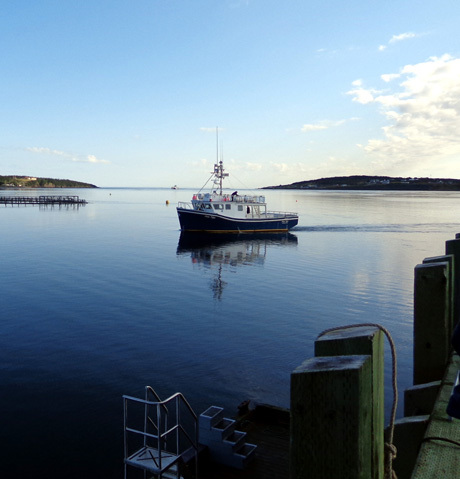 Two 4th-year marine biology students have spent the summer interning with the company and will finish their undergrad degrees this year. 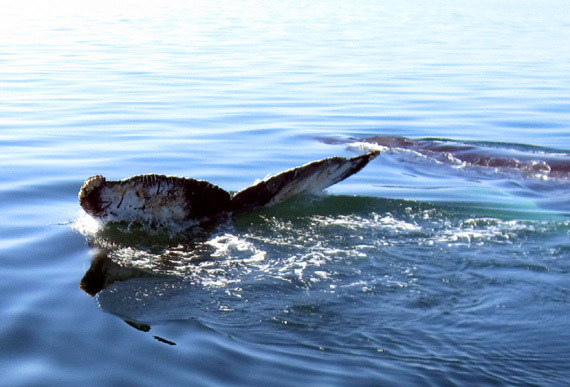 Both have loved being tour guides and contributing to the marine animal studies this company has been conducting since 1986.
whale's fluke (tail) just before it disappears under the water. We were about 6th-7th to board and were able to sit in the back corner where we could see at least two directions quite well. 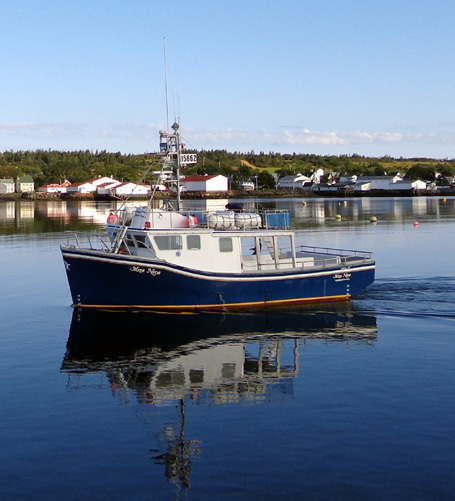 The boat did a clockwise loop around Brier Island and through the Bay of Fundy. We were on the island side, where we lucked out and had the best views of the island and whales. We feel like we got our money's worth on this cruise and highly recommend the company. We paid $68.40 CA total for the two of us. That was a special rate for all the adults today. 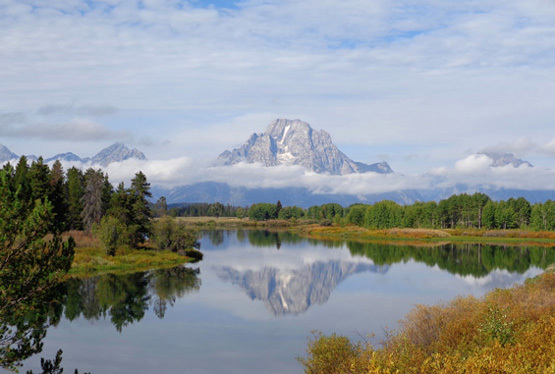 The company has several days each season that are specially priced at $29 CA + tax. Otherwise, the regular rate is $48 CA per adult plus a hefty provincial tax. Kids are less. The company has various discounts -- seniors, referrals from businesses like our campground, etc. off the regular price. This may look like one whale but it's two. Although we didn't see as spectacular scenery or as many different animals and seabirds as our longer cruise from Seward, Alaska to the Aialik Glacier two summers ago, we did get up very close to several humpback whales today. Whales are the company's focus, and they do a great job finding them. The crew members even know which whale is which if the boat gets close enough to identify the underside of their unique tails -- and they have named each of them. 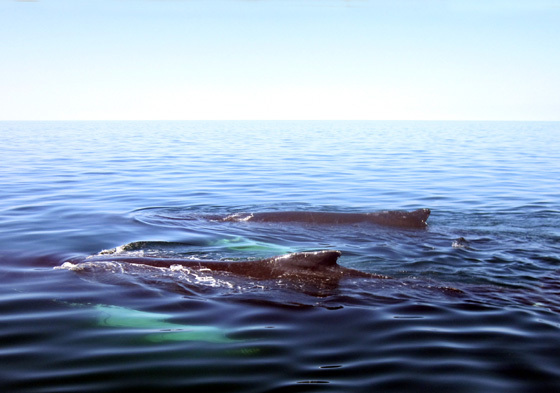 Each whale is given a number, a name, and placed in the North Atlantic Humpback Whale Catalogue. 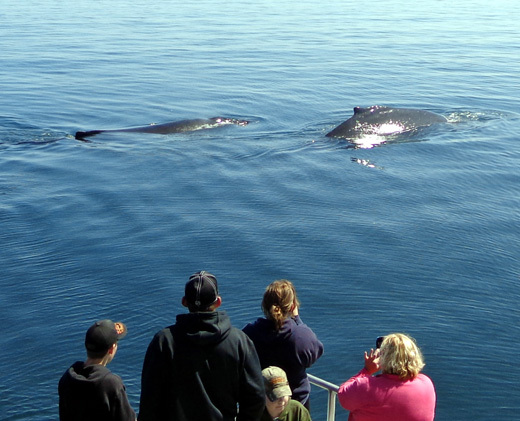 We also saw a minke whale from a farther distance (they don't like tour boats as well as humpbacks) and a finback whale. 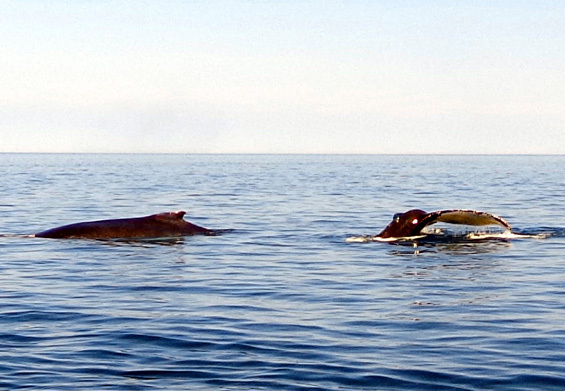 There are at least a dozen types of whales this summer in the Bay of Fundy, which is teeming with food for them. 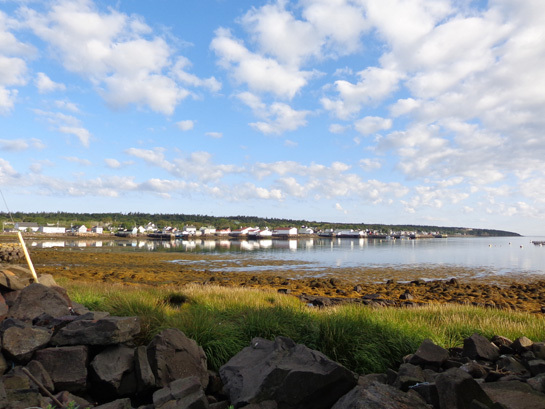 We also saw several pods of porpoises in Fundy Bay and a couple groups of harbor seals closer to the island in St. Mary's Bay but we didn't get any decent photos of them. Lots more pictures on the next page . . .